Its time for another Art Jewelry Elements Earring Challenge Reveal. Participants have challenged themselves to make a pair of earrings every week. 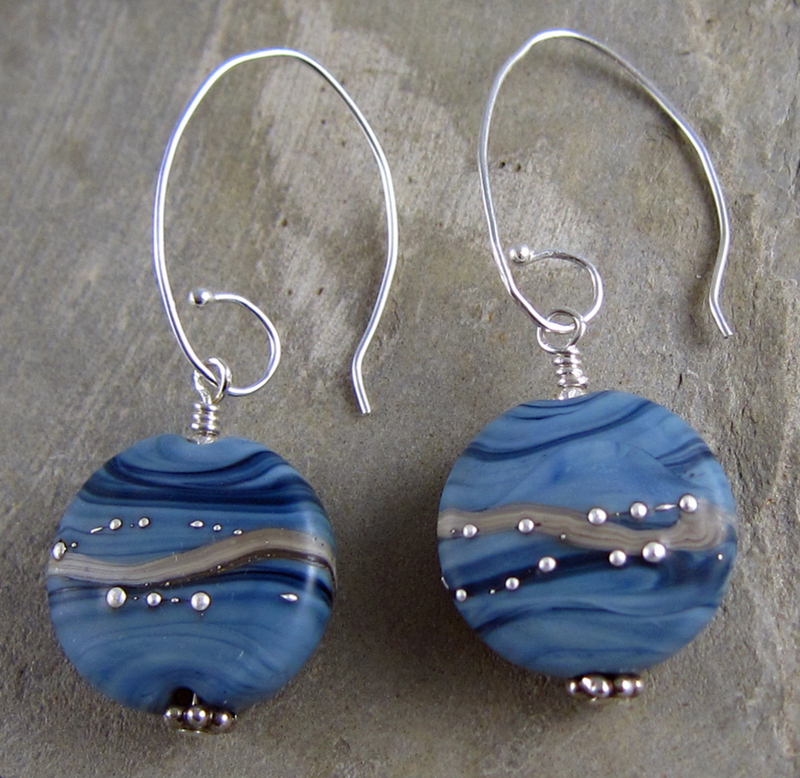 All of our earrings include art beads or components. Here are my new creations from the past 2 weeks. I’m in a really busy patch of time from now through mid-September. I have lots of wonderful events and learning opportunities on the horizon, but sometimes its hard to keep the necessary momentum going. A friend of mine hosts an annual Mother/Daughter weekend. I just returned home from that event this afternoon. We went kayaking, had a fire on the beach, played funny party games, ate, drank, reconnected with one another and laughed. At one point during the game we were playing, I was laughing so hard that tears were running down my cheeks! Anyway, with a lot going on, I only got one pair of earrings made since the last earring reveal. I’d made a similar pair recently, which were purchased from my Facebook page (I love it when that happens, btw). A friend of mine from a town we lived in 7 years ago spied those earrings and wondered if I could make her a pair also. 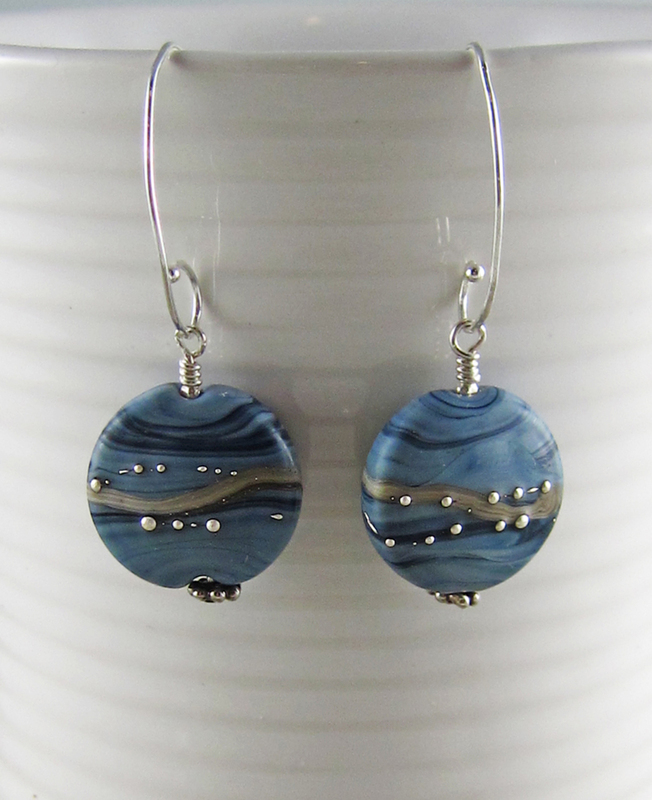 The earrings include denim blue lampwork glass beads from Stone Designs. So I contacted Sheila, the glass artist, and asked if she could replicated the beads. Once I received the beads from Sheila, I went looking for the distinctive earwires that I had used in the first pair of the Denim Elegance earrings. Couldn’t find any. So I made them myself. My friend told me she is delighted with her new earrings and that makes me very happy! This entry was posted in Art Beads and Components, Bead And Jewelry Challenges and tagged Art Beads, Art Jewelry Elements, bead blog, blog hop, earrings, fashion, handmade earrings, handmade jewelry, lampwork glass, Linda Landig Jewelry, Sheila Davis, Stone Design by Linda Landig. Bookmark the permalink. Beautiful earrings and I love the name you chose for them. Sounds like you had a busy but fun weekend! Thanks Alice. I had an awesome weekend with my daughter and the other women there. Lots of good camaraderie and fun. I think that style of earwire really adds to the overall elegance of your design, Linda! Sheila’s beads are gorgeous and I love the simply beautiful and elegant way you show cased them! Thank you. I’m glad to have met Sheila through you! Fantastic blog, Thanks for sharing.